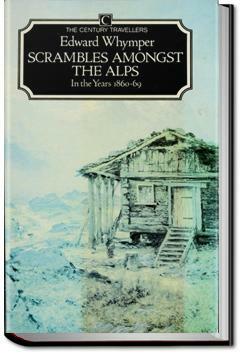 Scrambles Amongst the Alps is one the great classics (some would say the greatest) of early mountaineering literature, and Edward Whymper one of the leading figures of the early years of Alpine climbing. He is best known, of course, for his many attempts on the Matterhorn, and for the loss of four members of his climbing party after the successful first ascent of the peak in July, 1865. Although the Matterhorn stands in ways in the center of his book, there are descriptions of many other ascents as well, in the Alps of France and Italy, as well as those of Switzerland.
. . . in his company, proceeded to the summit of the pass which I had crossed in 1860; but we were baffled in our attempt to get near the mountain. A deep notch with precipitous cliffs cut us off from it: the snow-slope, too, which existed in the preceding year on the Piedmontese side of the pass, was now wanting, and we were unable to descend the rocks which lay beneath. A fortnight afterward the mountain was ascended for the first time by Messrs. Mathews and Jacomb, with the two Crozes of Chamounix. Their attempt was made from the southern side, and the ascent, which was formerly considered a thing totally impossible, has become one of the most common and favorite excursions of the district. I'm re-reading now. My daughter read it in "literature" seminar course at Emory featuring Pomo take on mountaineering. Whymper was in the first party to climb the Matterhorn, he was the only survivor of the climb. Have just re-read this classic, he talks about where I live, which makes this rather dry book more interesting. There's now a huge statue of him here which I drive past every day on my way to work. What language and what humor. A thoroughly enjoyable read not to be missed out on by all of us who live for the mountains. A great classic both of mointaneering and literature in one. Edward Whymper wrote down first hand his impression and beautiful drawnings on his adventures and early climbs in the Alps (it's funny he called it just "scrambles", while in fact he was climbing pretty hard). Recent climbing fatalities in the French Alps drew me back to Edward Whymper’s classic work, an account of his many excursions and victories in the Alps and most notably the story of the first ascent of the Matterhorn in 1865 and the expedition’s tragic descent. A little dry but still a classic.